Dörte, Sarah, and I spent the previous night at a nice restaurant in Quito and it certainly felt like, when waking up at 4am, that I had not slept at all. We were lucky however, a couple of members of our group landed at 2am, only to pass themselves leaving as they arrived at the hotel. Our flight departed Quito’s shiny new airport at around 6am and headed to Guayaquil for a quick stopover to pick up a few more passengers before flying across the sea to the mystical islands of Galapagos. 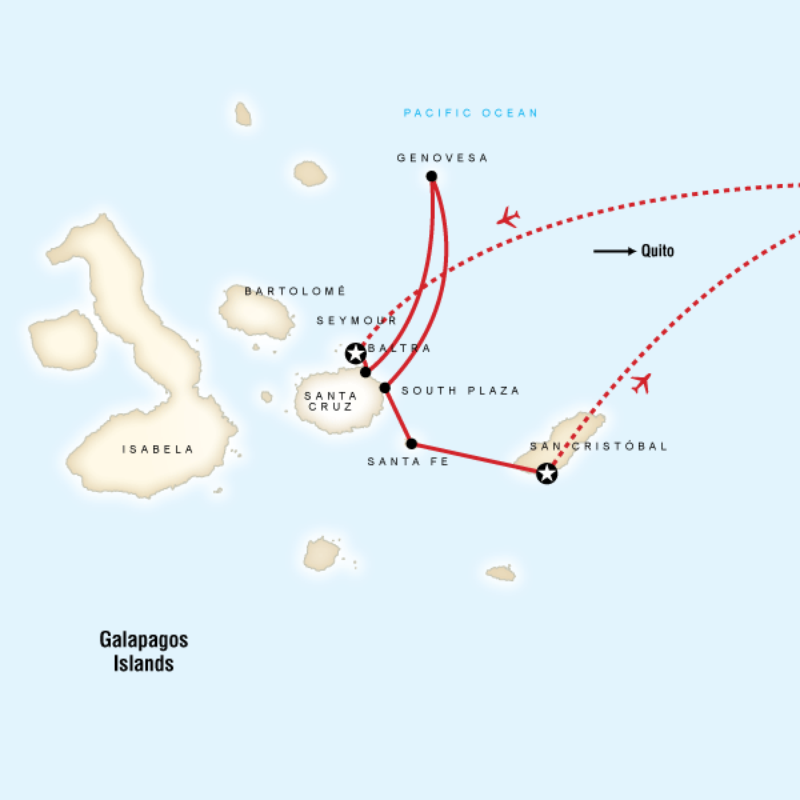 The Galapagos Islands were discovered on March 10th 1535 by the 4th Bishop of Panama, Fray Tomás de Berlanga. He, like most explorers, arrived by accident. Aiming to sail to Peru to resolve a dispute on how the territories of Inca Empire should be divided up, his ship stalled in the sea and the currents took him to the magical islands. But like many claims of discovery, there are disputes to this. It is believed that Topa Inca Yupanqui, the 10th Sapa Inca of the Inca Empire visited the islands sixty years previously as it is recounted in Incan Oral history of visiting two islands of fire. It wasn’t until 1935 that Charles Darwin visited the islands, who’s population stood at around 300 people. Forty years later Sir David Attenborough visited, adding to the fame of the islands and really bringing their marvel to the rest of the world. He has only visited those islands a further two times. We landed at the former US Air Force strip, now called Seymour Airport, on Baltra island on a very beautiful day. Departing the plane we walked across the tarmac to the terminal, a shiny new and very environmentally friendly building. Picking up our bags and getting our passport stamped we met our G-Adventures guide, Pedro. Pedro was a delight throughout the trip; his humour, passion for the place he grew up in, and knowledge that would make Attenborough proud - all ensured the trip would be memorable. Gathering the group together he announced “Welcome to the Galapagos my friends! Now get your walking shoes on, a bottle of water, the adventure begins now!”. We all expected to be heading to our boat, settling in, relaxing and catching the breeze…but no; there was no time to lose - we’ve got islands to explore! Our bags were heading direct to the boat, and we headed in the opposite direction to discover a colony of giant tortoises. This was just brilliant. Arriving at the sanctuary our group gathered again to get a brief from Pedro on the place we were visiting, how we should conduct ourselves (to preserve and protect the islands and it’s wildlife). Rudy, a retired sales manager from Canada. Another Dave from the UK who used to be a sports teacher. Linked with sport was Louisa a retired Physio from Canada (and who worked with the Olympic team!). Backing up team Canada was Christine a retired medical social worker who was originally from the UK but made the right decision to emigrate. We had husband and wife team Bryan and Eleanor from the beautiful Ireland; Bryan worked on the Viagra drug as pharmaceutical engineer and Eleanor works in education. Supporting team Ireland was Peter who worked in the government (I think he collected taxes but won’t admit it). The dynamic duo from Denmark Hannah and Hannah, a retired hairdresser and the other a chief accountant. Their story is great as at 70, they met at their local bridge club and decided to go travelling together. From Australia was the very smart Sandra, a university lecturer in biological sciences - the Galapagos must have been heaven for her. 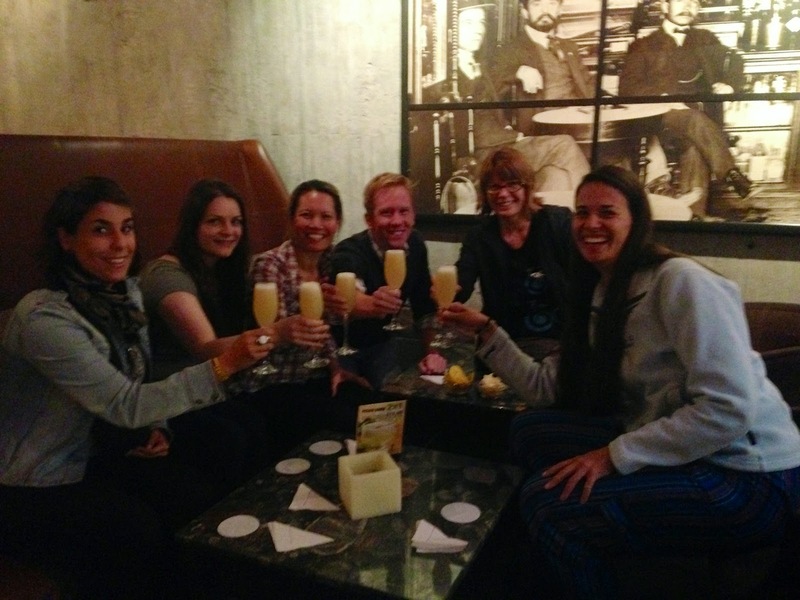 Back to Europe, there was Louise from England, an animator who’s done some really cool work for Nickelodeon. Sarah, a medical person in Switzerland and Dörte a funky plastics engineer from Germany. And of course there was team Laos, and myself from Barnsley! With the sun piercing down at you the day was stunning, and as we walked through the designated pathway you could spot our first tortoise - in fact I think there were four or five of them. They resting in the mud, attempting to stay cool. I for one was wishing I was in there - forgetting to bring my hat, but bringing my rain coat, I donned my superman outfit (placing the hood over my head and wearing it like a cape), i managed to stay safe. For the next hour or two it was pretty much the same; turning corners and seeing this remarkably giant and ancient creatures, undeterred by our presence. After resting for a drink at the local restaurant / cafe at the reserve, we headed onto the bus and towards the dock to meet with our boat. Our boat was called the San Jose, a permanent chartered boat for G-Adventures. Lead by Captain Francisco, the boat is cared for by a friendly and helpful crew. Helmsmen Johnny, Sailor Elliot, Food made by Eddy and his assistant chef Aramando. Another Pedro made sure the engines were kept running. Shirley was the only female crew member and was in charge of housekeeping; whilst Jeffery tended to the passengers needs as a barman, waiter and commander of big smiles! 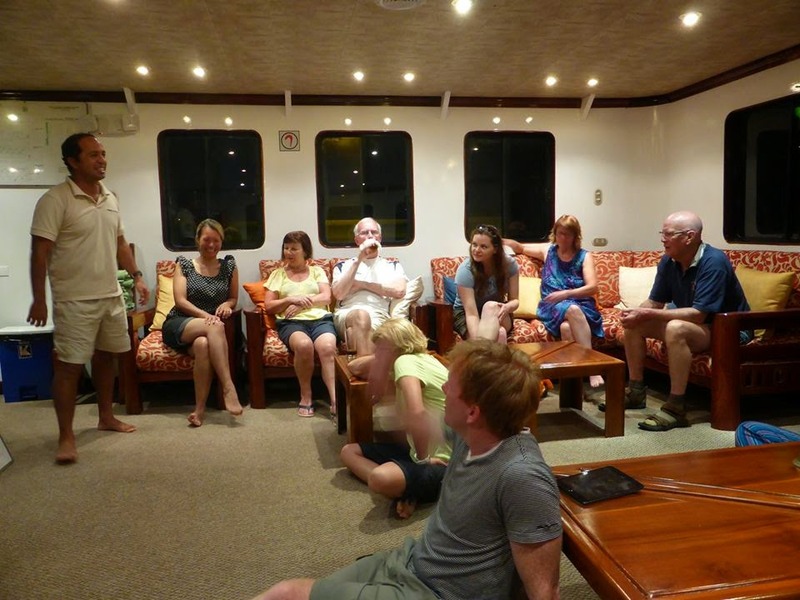 We arrived on our boat, settled in, and met for a formal briefing (e.g. what to do in emergencies and what the plan is for the next few days). The plan was to sail to Mosquera, Genovesa, South Plaza, Santa Fe, and San Cristobal. At each point there will be land excursions to view the different grades of the land (volcanic, grassland, etc). How the various types of cactus and other plants survive and protect (or not protect themselves). The different species of birds. And best of all the opportunity to go snorkelling. A lot of snorkelling. Once we had something to eat, we were back on our little speed boats heading towards a small islands colony of seals. This would be a real opportunity to get up and close with the animals, one I didn’t expect how close you can actually get up to them. After an exciting disembarkation we landed on the beach. There were seals everywhere. It was incredible. We were rightly briefed to keep our distance from them so that they don’t get the scent of a human on them, and thus become abandoned by their mothers of families. A good hour or two passed simply in awe at these creatures and we were back on board heading to the ship to get refreshed and prepped for snorkelling. Snorkelling in the Galapagos is like no other no snorkelling I’ve experienced; and I’ve been lucky to have been to some of the most magnificent ocean wildernesses. With the Galapagos, the wildlife isn’t too afraid to approach you. They feel safe around you. Something that they’ve come to terms with over the past hundred or so years. That’s not to say that they will let you pat them, that’s still a no no. The days at the Galapagos Islands went very quickly, but were truly mind blowing. Many of the trips have you in awe at the spectacle of nature, and rather using words describing it - simply check out the pics. The first two below are two 'same' types of cactus on different islands. One of them has the usual prickly thorns, whereas the other (due to no predators) evolved to have soft furry hairs instead. Below you can see the crater of the volcano that formed this amazing island. This bird, after diving in the sea, dries off its wings. The opportunity to get up and close to these animals is incredible. It's having a baby! The egg is so coloured to aid in camouflage. A fight broke out between these two different species of lizard over a piece of cactus.